We searched high and low for the highest quality cover that is fit to display the Brenspeed logo. 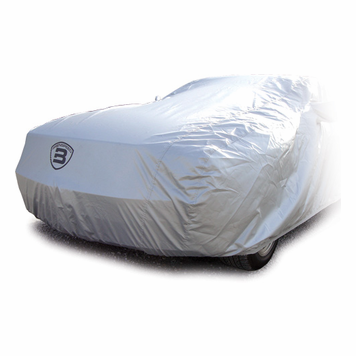 This high quality, state of the art cover utilizes 100% polyester fibers with a special formulated silver coating to offer protection against dust, dirt, tree sap, bird droppings, salt air, smog, and the cars worst enemy the sun! Sunlight causes both interior and exterior damage to your car such as fading paint, upholstery and carpeting, drying and cracking of the dashboard, leather, and vinyl. 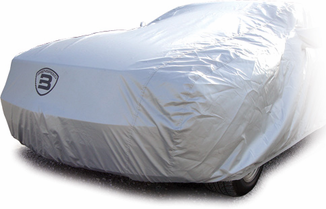 By taking a few minutes to cover your car you will save time and money in washing, waxing, and overall maintenance. This cover includes a security cable, padlock, and key to help prevent any theft of your high quality cover. It also includes installation and maintenance instructions, carry bag, and a 2 year manufacturer warranty. This tight fitting cover will wrap your Mustang from the front all the way around your exhaust tips. The sides will stay tight and the cover even wraps around your mirrors. This cover defines the term fitted.